Today's Meatless Monday Recipe Round-up via my posts over at Babble's Family Kitchen include .. a warm breakfast buckwheat bowl (gluten-free! ), 21 common vegan cooking mistakes slideshow, strawberry chocolate raw tart, cinna-chili popcorn, a discussion on virgin coconut oil, news on my recipe gallery, a FindingVegan.com milestone and more. Start today and keep meatless going all week long!.. Milestone Moment to my other site FindingVegan.com - it has reached over 10,000 posts in the past 18 months - all thanks to all the very talented bloggers who have submitted their photos/recipes. A big THANK YOU - keep those submissions coming so the world can see what vegan really tastes/looks like! Check them out on Finding Vegan! This gluten free hot cereal gives you a tasty break from oats. 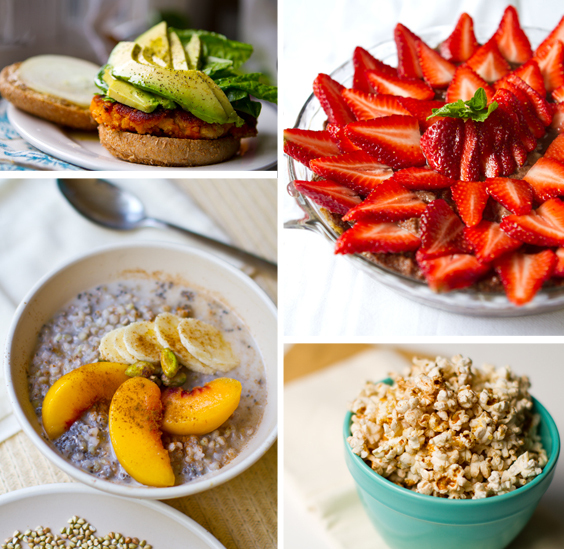 Plus learn about why buckwheat is so good for you! * Cooking Tips: 21 Common Cooking Mistakes: VEGAN Edition! I've made my fair share of vegan mistakes in the kitchen - so now I'm sharing them with you! I make the mistakes so you don't have to! This warming spicy-sweet popcorn will make the whole house smell like bliss. Bring on movie night. Blueberry Waffles, a steamy coffee beverage, some fruit and a long lingering AM. Recipes for an awesome waffle breakfast morning. Fluffy berry-cocoa cakes slathered in my vegan cream cheese frosting. Fancy yet comforting. Whether you are trying to lose a few pounds or simply maintain your healthy weight - these slimming tips will keep you on your toes as you power through your day and fill up on plenty of healthy foods. A recent study said that eating two apples a day can significantly improve your cholesterol levels. More about the study and nine apple recipes! * Nutrition: Virgin Coconut Oil for a Healthy Metabolism? I've been using a lot of virgin coconut oil lately - so I wanted to chat about a few of the health claims and the claim that it actually boosts metabolism - basically calling itself a "fat" to help reduce "fat." How to turn mushrooms into faus seafood dishes like "clam" chowder and "scallops" - a fun look at how to fake-out your meal with tasty vegan mushrooms. This versatile recipe was featured in my Pesto/Ricotta Vegan Pizza - but you can use it for lasagna, as a dip, dolloped on top of salads and more. Fresh strawberries and a creamy cashew cacao mixture are the stars of this dessert show! Simple dessert using vegan white chocolate chips and coconut - no bake! Peanut butter lovers fruit shake with creamy banana and sweet whole apple! 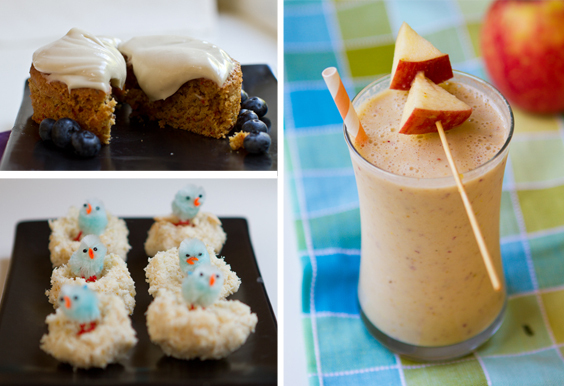 Can you guess my #1 recipe to celebrate Earth Day? A veggie burger .. my Easy Sweet Potato Veggie Burger with Avocado! About my Meatless Monday round-ups: Every other week (or so) I link to my recent posts over at Babble.com so that you don't miss out on any of my recipes. My round-up is a great way to embrace Meatless Monday. * 4/2 - Cashew Dip, Purple Smoothie - nutrition super post!